Hutchwilco New Zealand Boat Show reveals $200k+ Surtees/Yamaha Grand Prize! 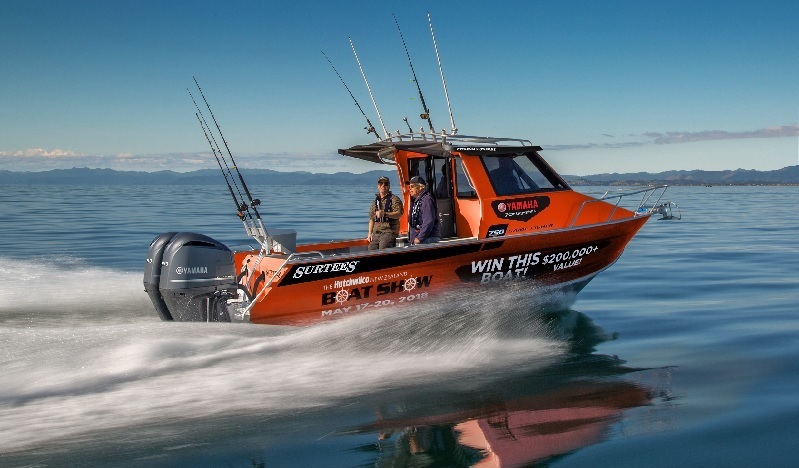 Organisers of the 2018 Hutchwilco New Zealand Boat Show have revealed that this year’s Grand Prize Package will be a Surtees 750 Game Fisher (Enclosed Cabin), powered by twin Yamaha 150HP XCA Digital Electronic Control (DEC) 4-stroke engines, and valued at over $207,000! The incredible Surtees/Yamaha Grand Prize — almost certainly the highest value must-be-won prize ever offered at any boat show anywhere in the world — will be drawn, and won, at the 2018 Hutchwilco New Zealand Boat Show in Auckland on May 17-20. Show organiser Dave Gibbs says he believes this amazing prize will attract a huge amount of attention, both from the boating and fishing communities and from the wider public. “Imagine: you pay $20 to attend New Zealand’s largest boat show, have a great day checking out all the latest boats, engines, electronics, accessories and boating and fishing gear and then head home. “Then, sometime a little after 7pm on Sunday, May 20, your phone rings and its Surtees CEO, Adam Dyck — and he’s telling you that you are now the proud owner of a Surtees/Yamaha Grand Prize package worth over $200,000! At the heart of the Surtees/Yamaha Grand Prize is the company’s largest production model: the 750 Game Fisher Enclosed Cabin. The Surtees 750 Game Fisher is perfectly designed for extended adventures away, from long family weekends cruising along the coast to serious offshore game fishing expeditions. The spacious, carefully laid-out cockpit provides a stable platform with enough room to land the big ones, plenty of clever storage to keep everything neatly stowed and a fully-plumbed livebait tank. Further forward, the enclosed cabin offers full protection from the elements, delivering comfort and shelter on the move and at rest. The intuitive dash, with its full array of Garmin electronics, puts everything at the skipper’s finger-tips while a 5-piece safety glass windscreen provides exceptional visibility. Also on board will be a sink, complete with 80-litre fresh water tank, an alcohol stove for cooking the catch and an Engel 42-litre fridge to keep everything cool. Perhaps most importantly, the 750 Game Fisher comes packed with Surtees’ SiQ™ technology and features to deliver superb handling in all conditions as well as outstanding stability, both at rest and while underway. Surtees’ unique SiQ™ includes their Anti-Roll™ ballast stability control with Anti-Roll Lock™, Razortech™ smooth riding hull, Touch Deck™ super rigid hull construction, Safety Buoyancy airtight flotation compartments, Quik-Hitch™ trailer catch system and Surtees 10-year warranty. Ensuring the Surtees/Yamaha Grand Prize Package gets safely and smoothly to its distant destinations and back is a pair of Yamaha’s very latest 150hp 4-stroke engines. Yamaha’s new 150hp XCA DEC outboards come complete with larger 2.8 litre displacement engines, delivering increased- and mid-range torque. This will enable the Surtees/Yamaha Grand Prize Package to leap quickly and effortlessly onto the plane — and to perform superbly once on top. The Surtees/Yamaha Grand Prize Package will have a top speed of at least 43 knots, cruise comfortably and economically at 20-22 knots and boast a cruising range of over 250 nautical miles! The Grand Prize’s powerful new outboards also come complete with digital gauges, a dual binnacle control box — and Yamaha’s premium Digital Electronic Control (DEC) technology, previously only seen on Yamaha’s big horsepower range. A sophisticated ‘fly-by-wire” control system, DEC delivers extremely smooth and precise throttle operation, ensuring a more enjoyable and effortless boating experience. So that it can safely and comfortably move around the country’s coastline and waterways, the Surtees/Yamaha Grand Prize will proudly sit on a stylish, top-of-the-line Epic trailer worth almost $18,000 and come complete with a Balex Auto Boat Loader. It will also come with a comprehensive $10,000-plus Garmin electronics package, including a GPSMap 7412xsv multi-function display, GMR 24xHD radar, a GT51 M-TM mid-CHIRP down view and side view sonar and transducer, a VHF and a New Zealand chart. Remote anchoring will also be a breeze thanks to the Loan Star drum winch system. Also on board is Ultraflex hydraulic steering, a comprehensive Hella LED lighting package with cabin, helm, cockpit, floor and bait tank lighting, Seadek flooring in the cabin and cockpit and on the coamings, a Fusion stereo system. The Surtees/Yamaha Grand Prize also comes complete with a set of Hutchwilco lifejackets and a year’s Yamaha Marine Insurance. The 2018 Hutchwilco New Zealand Boat Show will be held at the ASB Showgrounds in Greenlane, Auckland on May 17-20. Tickets to the show are now available on-line at www.boatshow.co.nz with all tickets bought before May 10, 2018 also automatically in the draw to win a powered Viking Kayaks package worth over $8000. Full details about this amazing Surtees/Yamaha Grand Prize package, along with all the terms and conditions are on the show’s popular website: www.boatshow.co.nz. Open: 10am to 6pm; late night Friday to 9pm. Admission: Adults: on-line $18; at the gate $20; children 16 & under FREE.